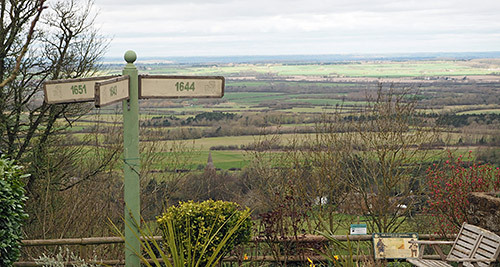 The Battlefields Trail is a 20 mile footpath that runs through three of the most famous battlefield sites in the Midlands. 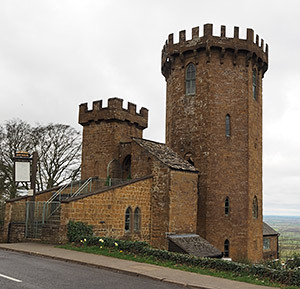 The route begins at Chipping Warden in Northamptonshire and ends at Kineton in Warwickshire. Edgcote (1469) a battle during the Wars of the Roses in Northamptonshire. Cropredy Bridge (1644) an English a Civil War battle in Oxfordshire. Edgehill (1642) the first major action of the English Civil War in Warwickshire. The first battle of the English Civil War took place in Edgehill on October the 23rd 1642. Prior to this encounter King Charles raised his standard in Nottingham and was marching with his army towards London. The Roundheads under the command of the Earl of Essex marched from Worcester to intercept him. The king deployed his troops at the high ground at at Edgehill. He famously decided to engage the enemy with just a few hours of daylight left. Initially the battle went well for the King and the Roundhead cavalry was routed. By the time dusk fell some 1500 had been slain and many more wounded, resulting in a stalemate situation. King Charles eventually broke camp and resumed his March to London while the parliamentarians moved on to Warwick. The castle at Edgehill was built 100 years after the battle by Sanderson Miller. It was designed as an impressive Folly to entertain his friends at the place where King Charles had raised His Royal Standard. Within the grounds of the castle is a garden that provides magnificent views across the valley and the ancient battlefield site. An information board in the grounds of the castle tells the story in more detail, and indicates the route of the Battlefields Trail here.